در سال‌های اخیر آزمایشات تجربی متعددی در خصوص تقویت برشی تیرهای بتن آرمه مسلح به الیاف پلیمری صورت گرفته است. در این راستا روابطی نیز برای تخمین مقاومت برشی تیرهای مسلح به الیاف پلیمری ارائه شده است. هدف از این مطالعه بررسی تخمین مقاومت برشی تیرهای مسلح به الیاف پلیمری بوسیله مدل شبکه عصبی مصنوعی پیش خور است. برای این منظور یک پایگاه داده متشکل از 304 تیر بتن­آرمه مسلح به الیاف پلیمری جهت ارزیابی رفتار برشی، از نتایج‌ تجزیه‌ و تحلیل‌ مقالات موجود گردآوری شده است. متغیرهای ورودی مدل شبکه عصبی شامل 11 متغیر دربرگیرنده مشخصات هندسی مقطع، میزان آرماتور، میزان الیاف پلیمری و مشخصات مصالح بتن و فولاد و الیاف پلیمری است و متغیر خروجی مقاومت برشی تیر است. بمنظور ارزیابی کارایی مدل شبکه عصبی در تخمین میزان ظرفیت برشی تیرهای تقویت شده، نتایج کسب شده از مدل شبکه عصبی با مقادیر روابط آیین نامه بتن ایران (نشریه 345) و آیین نامه بتن امریکا (ACI440) مقایسه می‌شود. مقایسه نتایج نشان می دهد که در مجموع دقت مدل شبکه عصبی نسبت به دقت هر دو آیین­نامه­ بیشتر است. بطور مشخص برای داده های مورد بررسی، درصد میانگین نسبی مطلق خطای برآورد در مدل شبکه عصبی 13 درصد، آیین نامه امریکا 34 درصد و آیین نامه ایران 39 درصد است. In recent years, numerous experimental tests were done on the concrete beams reinforced with the fiber-reinforced polymer (FRP). In this way, some equations were proposed to estimate the shear strength of the beams reinforced with FRP. The aim of this study is to explore the feasibility of using a feed-forward artificial neural network (ANN) model to predict the ultimate shear strength of the beams strengthened with FRP composites. For this purpose, a database consists of 304 reinforced FRP concrete beams have been collected from the available articles on the analysis of shear behavior of these beams. The inputs to the ANN model consists of the 11 variables including the geometric dimensions of the section, steel reinforcement amount, FRP amount and the properties of the concrete, steel reinforcement and FRP materials while the output variable is the shear strength of the FRP beam. To assess the performance of the ANN model for estimating the shear strength of the reinforced beams, the outputs of the ANN are compared to those of equations of the Iranian code (Publication No. 345) and the American code (ACI 440). The comparisons between the outputs of Iran and American regulations with those of the proposed model indicates that the predictive power of this model is much better than the experimental codes. Specifically, for under study data, mean absolute relative error (MARE) criteria is 13%, 34% and 39% for the ANN model, the American and the Iranian codes, respectively. Noel, M. and Soudki, K..(2011) Evaluation of FRP posttensioned slab bridge strips using AASHTO-LRFD Bridge design specifications. 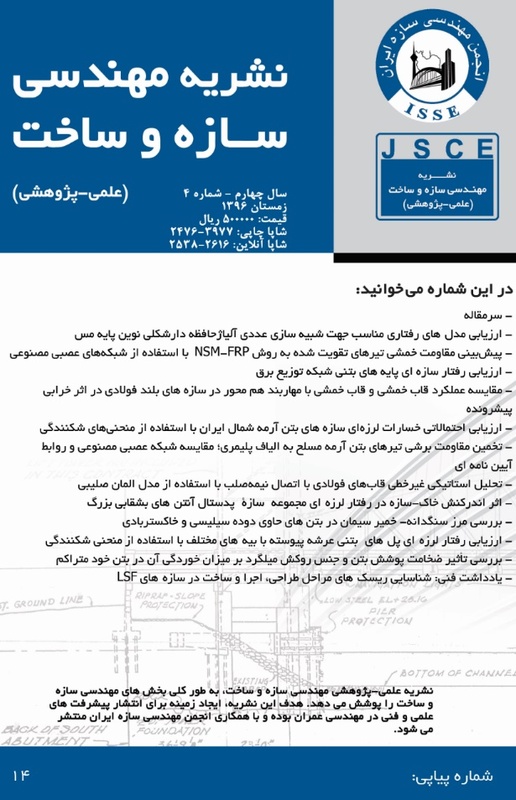 Journal of Bridge Engineering, Vol. 16, pp. 839-846. Esfahani, M R., Kianoush, M R., Tajari(2007) Flexural behaviour of reinforced concrete beams strengthened by CFRP sheets. Engineering Structures. No. 29, pp. 2428–-2444. Mabsout, M., Tarhini, K., Jabakhanji R and Awwad E.(2004) Wheel load distribution in simply supported concrete slab bridges. Journal of Bridge Engineering, Vol. 9, No. 2, pp. 147-155. Gamino, A. L., Sousa, J. L. A. O., Manzoli O. L. and Bittencourt, T. N.(2010) R/C Structures strengthened with CFRP Part II: Analysis of shear models. IBRACON Struct. Mater. J., Vol. 3, No. 1, pp. 24 – 49. Sobuz, H. R., Ahmed, E., Hasan, N. M. S., and Uddin M, A (2011). Use of carbon fiber laminates for strengthening reinforced concrete beams in bending. International Journal of Civil and Structural Engimeering. Vol. 2, No. 1, pp. 89-102. Shahawy, M A., Arockiasamy, Beitelmant T. (2010). Reinforced concrete rectangular beams strengthened with CFRP laminates. Composites: Part B: Engineering, Vol. 27, No. 3-4, pp. 225-233. Rahimi, Allan Hutchinson (2001). Concrete beams strengthened with externally bonded FRP plastes. Journal of Composites for Construction, Vol. 5, No. 1, pp. 59-68. Abdel-Jaber, M. S., Walker, P. R., and Hutchinson, A. R. (2003). Shear strengthening of reinforced concrete beams using different configurations of externally bonded carbon fiber reinforced plates. Materials and Structures/Materiaux et Constructions, Vol. 36, pp. 291-301. American Concrete Institute, ACI 440.2R, (2008). Guide for the design and construction of externally bonded FRP systems for strengthening concrete structure. Farmington Hills, Mich: ACI Committee 440. Publication No. 345, (2006). The guideline for design specification of strengthening RC buildings using fiber reinforced polymers (FRP).Office of Technical Affairs Deputy Technical, Criteria Codification and Earthquake Risk Reduction Affairs Bureau. JSCE Guidelines for Concrete, Standard specifatons for concrete strucores (2007). Materials and Construction. Railway Technical Research Institute (1994-2017). Standards Council of Canada, (2016). 55 Metcalfe Street, Suite 600, Ottawa, ON K1P 6L5 Canada. Taljsten, Bjorn (2003). Strengthening concrete beams for shear with CFRP sheets. Constr. Build. Mater. Vol. 17, No. 1, pp. 16-27. Khalifa, A., A Nanni (2002). Rehabilitation of rectangular simply supported RC beams with shear deficiencies using CFRP composites. Construction and Building materials, Vol. 16, No. 3, pp. 135-146. Triantafillou, T. C, و C. P Antonopoulos (2001). Design of concrete flexural members strengthened in shear with FRP.” J. Compos. Constr., Vol. 4, No. 4, pp.198-205. Zhang., Zhichao, Hsu, Cheng-Tzu. Thomas. And Moren, J (2004). Shear strengthening of reinforced concrete deep beams using carbon fiber reinforced polymer laminates. Journal of Composites for Construction, Vol. 8, No. 5. pp. 398-412. Chaallal, O., Nollet, M. J.,,Perraton, D., (1988). Shear strengthening of RC beams by externally bonded side CFRP strips J. Compos. Constr., Vol. 2, No. 2, pp.111–113. Triantafillou, T.C., Plevris, N., (1992). Strengthening of RC beams with epoxy-bonded fibre-composite materials. MaterialsandStructures, NO. 25, pp. 211-219. Taerwe, ed. (1995). Non-Metallic (FRP) Reinforcement for concrete structures. Proceedings of the Second International RILEM Symposium (FRPRCS-2). pp. 169-181. Sayed, AM., Wang, X., and Wu, Z. (2013). Modeling of shear capacity of RC beams strengthened with FRP sheets based on FE simulation. J. Compos. Constr., Vol. 17, No. 5, pp. 687-701. Norris, T., Saadatmanesh, H. and Ehsani, M. R (1997). Shear and flexural strengthening of R/C beams with carbon fiber sheets. J. Struct. Eng., Vol. 123, No. 7, pp. 903-911. Kobayashi, K., Kanakubo, T. & Jinno, Y (2007). Seismic retrofit of structures using carbon fibres. s.l., s.n., pp. 1-21. El-Maaddawy, T., A. Chahrour, K. A and Soudki (2006). Effect of FRP-wraps on corrosion activity and concrete cracking in chloride-contaminated concrete cylinders. Journal of Composites for Construction, Vol. 10, No. 2, pp. 139-147. Chajes, M. J., Thomson Jr, T. A., Januszka, T. F., and Finch Jr, W. W (1994). Flexural strengthening of concrete beams using externally bonded composite materials. Construction and Building Materials. Vol. 8 NO. 3, pp. 48-57. Carolin, A, و B Taljsten (2005). Experimental study of strengthening for increased shear bearing capacity. Journal of Composites for Construction, Vol. 9, No. 6, pp. 27-39. Chen, J F., J G Teng (2003). Shear capacity of FRP-strengthened RC beams: FRP debonding. Construction and Building Materials, No. 17, pp. 27-41. Arduini, M, و A Nanni (1997). Behavior of pre-cracked RC beams strengthened with carbon FRP sheets. Journal of Composites in Construction, Vol. 1, No. 2, pp. 63-70. Lu, X. Z., Teng, J. G., Ye, L. P. & Jiang, J. J. (2007). Intermediate crack debonding in FRP-strengthened RC beams: FE Analysis and Strength Model. Journal of Composites for Construction, Vol. 11, No. 2, pp. 161-174. Teng, J. G., Chen, G. M., Chen, J. F., Rosenboom, O. A. and Lam, L (2009). Behavior of RC beams shear strengthened with bonded or behavior of RC beams shear strengthened with bonded. Journal of Composites for Construction, Vol. 13, No. 5, pp. 248-260. Sundarraja, C. M., and Rajamohan, S (2009). Strengthening of RC beams in shear using GFRP inclined strips – An experimental study. Construction and Building Materials, No. 8, pp. 856-864. Stergiou, Christos, و Dimitrios Siganos (2008). Neural Networks180 Queen's Gate, London SW7 2BZ, UK: SURPRISE Journal volume 4. Imperial College of Science Technology and Medicine. MathWorks Inc (2013). MatLab the language of technical computing. Natick, MA, USA: MathWorks Inc; Version R2013b. Tanarslan, H. M., Ertutar, Y. and Altin, S (2008). The effects of CFRP strips for improving shear capacity of RC beam. Journal of Reinforced Plastics and Composites, Vol. 27, No. 12, pp. 1269-1285. Adhikary, Babu, B., Mutsuyoshi, H., (2004). Behavior of concrete beams strengthened in shear with carbon-fiber sheets. Journal of Composites for Construction, Vol. 8, No. 3, pp. 271-285. Bousselham, A., and Chaallal, O (2006). Effect of transverse steel and shear span on the performance of RC beams strengthened in shear with CFRP. Compos. Part B, Vol. 37, No. 1, pp. 37-46. Ianniruberto, U, Imbimbo, M., (2004). Role of fiber reinforced plastic sheets in shear response of reinforced concrete beams: Experimental and analytical results. J. Compos. Constr., Vol. 8, No. 5, pp. 218-425. Beber, A. J., and Filho, A. C. (2005). CFRP composites on the shear strengthening of reinforced concrete beams. Ibracon Struct. J., Vol. 1, No. 2, pp. 128-134. Pellegrino, C. and Modena, C (2008). An experimentally based analytical model for the shear capacity of FRP-stregth ended reinforced concrete beam. Mechanics of Composite Materials, Vol. 44, No. 3, pp.103-112. Diagana, C., Li, A., Gedalia, B., and Delmas, Y (2003). Shear strengthening effectiveness with CFF strips. Eng. Struct. Vol. 25, No. 4, pp. 507-516. Bukhari, A. I., Vollum, R., Ahmad, S., Sagaseta, J (2013). Shear strengthening of short span reinforced concrete beams with CFRP sheets. Arabian Journal for Science and Engineering. Vol. 38, No. 3, pp. 523-536. Mofidi, A., Thivierge, S., Chaallal, O. and Shao, Y (2014). Behavior of reinforced concrete beams strengthened in shear using L-shaped CFRP plates: experimental investigation. J. Compos. Constr. No.6, pp. 314-329. Singh, B. S (2013). Shear response and design of RC beams strengthened using CFRP laminates. International Journal of Advanced Structural Engineering. No. 5, pp. 86-98. Cao, S. Y., Chen, J. F., Teng, J. G., Hao, Z., and Chen, J (2005). Debonding in RC beams shear strengthened with complete FRP wraps. Journal of Composites for Construction, Vol. 9, No. 5. pp. 217-428. Li, L. J., Guo, Y. C., Liu, F. and Bungey, J. H (2005). An experimental and numerical study of the effect of thickness and length of CFRP on performance of repaired reinforced concrete beams. Construction and Building Materials, No. 20, pp. 901-909. Alzate, A., Arteaga, A., de Diego, A., Cisneros, D., and Perera, R (2013). Shear strengthening of reinforced concrete members with CFRP sheets. Materiales de Construcción, Vol. 63, No. 10, pp. 251-265. Umezu, K., Fujita, M., Nakai, H. and Tamaki, K. (1997). Shear behavior of RC beams with aramid fiber sheet. Proc. 3rd Symp. on Non Metallic (FRP) Reinforcement for Concrete Structures (FRPRCS-3), Vol. 1, pp. 491-498. Ozden, S., Atalay, M. H., Akpinar, E., Erdogan, H., and Vulas, Z. Y (2014). Shear strengthening of reinforced concrete T-beams with fully or partially bonded fibre-reinforced polymer composites. Structural Concrete, Vol. 15, No. 2, pp. 14-27. Garden, H. N., Quantrill, R. J., Hollaway, L. C., Thorne, A. M. and Parke, G. A. R. (1998). An experimental study of the anchorage length of carbon fibre composite plates used to strengthen reinforced concrete beams. Construction and Building Materials, No. 12, pp. 203-219. Ozden, S., Atalay, M. H., Akpinar, E., Erdogan, H., and Vulas, Z. Y (2014). Shear strengthening of reinforced concrete T-beams with fully or partially bonded fibre-reinforced polymer composites. Structural Concrete, Vol.15, No. 2, pp. 1-19. Panda, K. C., Bhattacharyya, S. K. and Barai, S. V (2011). Shear strengthening of RC T-beams with externally side bonded GFRP sheet. Journal of Reinforced Plastics and Composites, No16., pp. 1139-1154. Kim, G., Sim, J. and Oh, H. (2008). Shear strength of strengthened RC beams with FRPs in shear. Construction and Building Materials, No.22. pp. 1261-1270. Islam, M. R., Mansur, M. A. and Maalej, M. (2005). Shear strengthening of RC deep beams using externally bonded FRP systems. Cement & Concrete Composites, No. 27, pp. 413-420. Manos, G. C., Kourtides, V. and Matsukas, P. (2007). Investigation of the flexural and shear capacity of simple R/C beam specimens including repair schemes with fiber reinforced plastics. Proceedings of the eighth international symposium on fibre-reinforced polymer (FRP) reinforcement for concrete structures (FRPRCS-8). No. 129, pp.16-28. Sundarraja, C. M., and Rajamohan, S. (2009). Strengthening of RC beams in shear using GFRP inclined strips – An experimental study. Construction and Building Materials, No.4, pp. 856-564.